But let’s face it, I work on a ranch so my needs for hairspray are few. The cows don’t mind one bit if I have my hair pulled back in a ponytail! But my board-straight hair does need some help when we’re out and about. I’ve toyed around with different ingredients before but this time I’m pretty pleased with the results. I allowed the rosemary to steep in the water for a couple of days using good ole solar power by placing the lidded jar on our picnic table during the 100-degree days typical during the summer in NE Texas. Then I brought the jar inside and strained the water and placed it in a microwavable container and heated it until it was hot, but not boiling. I stirred in a tablespoon of sugar until it was fully dissolved and allowed it to cool. Since I don’t want to keep this spray bottle in my refrigerator I needed a way to preserve it so it wouldn’t go ‘off‘. I noticed the commercial stuff has alcohol in the contents. So although I was hesitant at first to add it, I stirred in two tablespoons of rubbing alcohol as a preservative. It’s a very small amount and I’m sure the commercial stuff I’ve already been using has much more. I poured it all into my now-empty hairspray bottle and took it back to my makeup container to store. When I next needed to use hair spray I gave it a try and I was pleased with the results. It’s a wetter formula than the commercial stuff so you’ll want to spray lightly and allow it to dry. (which it does quickly I’m guessing because of the alcohol) Then give another quick spray if you find you need more hold. In this case less is more so you don’t want to use near as much as the commercial stuff. I found this formula to be pleasantly scented because of my rosemary infusion. And I’ve not had a problem with the contents going ‘off’ even after several months – again presumably because of the alcohol that’s stirred in as a preservative. This country girl’s pretty pleased with the results. 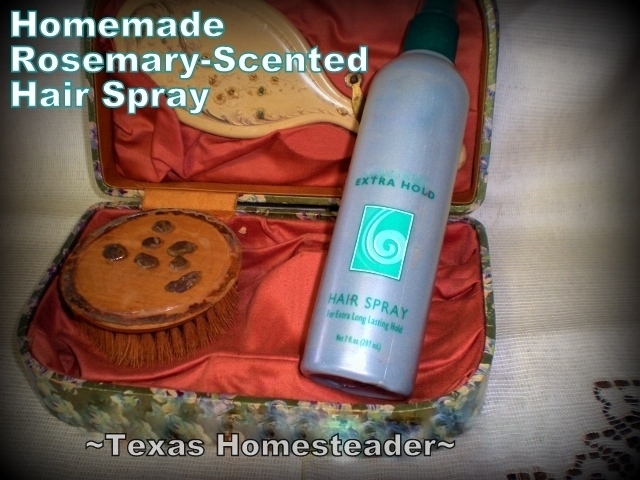 So there ya go, homemade hairspray. Measure 1/2 cup filtered water into a microwave-safe container and heat 30-45 seconds until hot. Stir in your sprigs of fresh rosemary. Allow the rosemary to steep in the water for at least an hour. Then strain the rosemary pieces from the water and place infused water in a microwavable container and heat about 30-45 seconds. Stir in a Tablespoon of granulated sugar until it is fully dissolved. When mixture is cool, stir in two tablespoons of rubbing alcohol to use as a preservative. Pour mixture into repurposed spray bottle. I use an empty hairspray pump bottle since it already sprays in tiny droplets, which are best for your homemade hairspray. To use, spray hair lightly and allow to dry. If a stronger hold is needed apply a second time and allow to dry. And you can also follow along on Pinterest, Twitter, or Instagram. 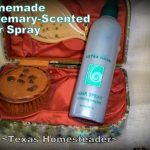 This entry was posted in Blog Posts and tagged Environment, Frugality, Make-It-Yourself on April 18, 2014 by Texas Homesteader. I’m definitely going to try this when my current bottle runs out. I’ll just have to remember to not use if I’m going to be working in my hives! Sounds similar to my recipe although I love that you’ve added rosemary! I do have one bit of criticism (sorry) but I’d love it if you actually listed the ingredients and directions like a recipe… just so it was all easier to find/make. Keep up the great posts!